While most celebrities have moved on to social channels like Snapchat, Instagram, Twitter, and sometimes Facebook Live or Periscope to share their thoughts and feelings, America’s favorite naked bongo-playing actor Matthew McConaughey is still sticking it out with YouTube. Unfortunately for him, however, literally no one cared. 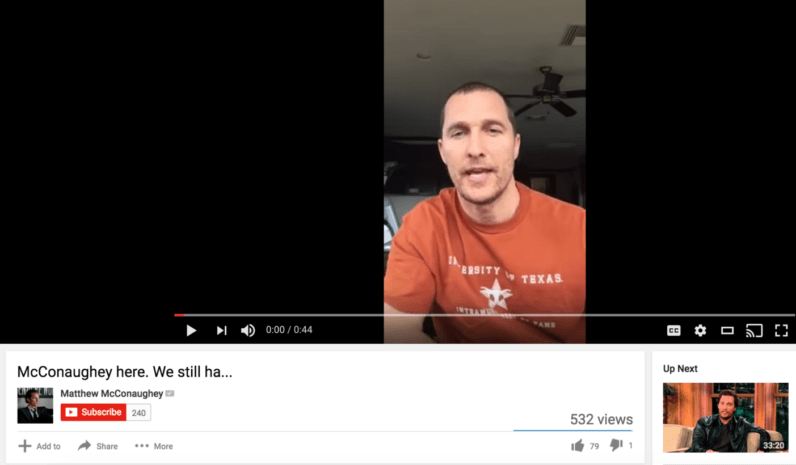 A 4Chan/Redditor recently surfaced McConaughey’s YouTube page, which has personal videos from the star encouraging fans to make charitable donations to help homeless children. Some videos have around 5,000 views (probably from the 4Chan and Reddit spike,) but one posted eight months ago boasts an abysmal 532 views despite the channel being verified. The video in question even has a single, sad downvote. At the time of publish, the channel has 240 subscribers. The actor does not have a Snapchat or Instagram account (at least that we’re aware of). But hey, at least now you don’t have to feel so bad if your YouTube career hasn’t taken off – fame ain’t easy on the internet. It’s kind of nuts to think that a star with more than 2 million followers on Twitter could have such a poor following on YouTube, especially with videos promoting a good cause. Don’t worry, Matt, we’re here to help. Please start making videos again and we’ll promise to watch this time.